Of course, like last year, a new year is upon us. It is a new year: A new year to grow in Christ, a new year to write on checks, and a new year for changes. Many people make New Year resolutions and while they are sometimes very good, healthy and beneficial, they often do not last more than a week or two. 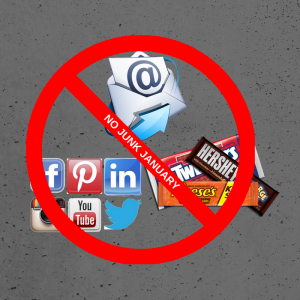 ONE – No Social Media in January. I have not been diagnosed with socialmediaitus, but it can be a time sink and a distraction. This challenge will benefit the mind. Healthy boundaries for social media are important and I plan reading an analog book and spending more time with my family. Meaningful relationships take time, not likes. Even if you are old school and listen to Morse code on reel to reel with your friends, it is important to evaluate how technology is affecting your life. TWO – No Overt Sugar. Many people make resolutions about what to eat or what not to eat and then get hung up in the details. For me, my plan is simple. No overt sugar, no soda, and no candy. I will stick to the natural sugar in fruits and substitute peanut butter for syrup on my pancakes. This will benefit the body. THREE – No Spiritual Junk. My focus will be less on devotionals and more on the Word of God. Different devotionals have challenged and comforted me over the years, but recently I have been noticing a craving for the just the Bible. I am also planning on not reading a number of Christian newsletters and updates received via email. While I like to stay abreast of world events, the world will not miss me in January. This commitment will greatly bless my spirit. The overarching goal is to bring glory to God with our mind, body and spirit. (Mark 12:30) We are in a process of being conformed to the image of Christ (Romans 8:29) and should make good choices that help that process rather than hinder it.